BACKGROUND: The 1990 report of a cluster of patients infected with the human immunodeficiency virus (HIV) associated with a Florida dentist with acquired immunodeficiency syndrome attracted considerable media coverage and legislative attention. A number of polls found that the public favored mandatory HIV-antibody testing of health-care workers. The Centers for Disease Control and Prevention, Atlanta, Ga, conducted a two-phase study to understand how public concerns regarding potential HIV transmission in health-care settings can be addressed by the medical and public health communities. METHODS: Sixteen focus group discussions in nine US cities were conducted to explore the public’s perceptions, concerns, and behavioral responses regarding HIV transmission in health-care settings. Using this information, a questionnaire was developed and administered to a nationwide probability telephone sample of 1150 adults. RESULTS: Concern about contracting HIV in health-care settings was highest for emergency department treatment and lowest for treatment by a personal physician. 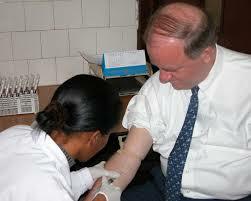 Two factors directly related to patient care, ie, the health-care professional’s willingness to discuss acquired immunodeficiency syndrome and the presence of acquired immunodeficiency syndrome educational materials in the waiting room, were considered useful factors for determining potential risk of transmission of HIV in a health-care setting. CONCLUSIONS: Public concern about the potential for HIV transmission in health-care settings remains high. Active steps on the part of health-care professionals, such as providing educational materials and initiating discussions about infection control procedures and about HIV and acquired immunodeficiency syndrome, could likely have positive effects in terms of alleviating these concerns.